吃喝玩樂 - Diary of a Growing Boy: Reptile night part 2: was the master beaten? Sautéed crystal king prawn (水晶大蝦球) - beautifully scored as expected. The texture was much softer than I expected - one might argue it borders on being mushy - but somehow I didn't really miss the crunchiness. I thought it was pretty tasty, with a certain level of delicacy I hadn't tasted in a while. Sautéed diced pig stomach with bamboo soot and celery (七彩炒肚尖) - I love this dish, and while this was tasty, it was a far cry from what we had at the private kitchen. There was very little wok hei (鑊氣) tonight... and that, boys and girls, is how you turn a good dish into one that is magical. Traditional braised assorted snake soup (正宗太史五蛇羹) - this was the pièce de résistance - the reason why we came tonight. The snake meat was shredded by hand, which may explain why the shreds weren't as fine as what we tasted at the private kitchen. In terms of overall flavor, it was even lighter and more delicate compared to the private kitchen. It was also less thick and viscous in terms of texture, although I wouldn't call it "watery". It was very delicious and fine, although most of us agreed that the version from the private kitchen was a shade better. Sautéed water turtle fillet with assorted vegetables (鳳城水魚絲) - another classic dish, and reptile #2 for the night. I absolutely loved this dish. The knife work was incredibly fine, and the meat was shredded so thinly. The gelatinous "skirt" was also shredded and I loved the texture. Stir-fried with spring onions, celery, green capsicums, red chili peppers, carrots, sweet pickled mustard and Indian almonds (欖仁). Sautéed giant garoupa fillet with vegetables (碧絲炒龍躉球) - so disappointing. Not that the dish tasted horrible, or the execution was off. In fact it was neither. The dish was as expected, but let's be honest, this was a total waste of a good and expensive fish. Yes, they scored the fish fillets nicely, but this was ordinary to the extreme. The best parts of a giant garoupa are its fins and the thick, chewy skin with that nice layer of fat underneath. Getting rid of the skin robs it of its true flavors. I should have rejected this dish when it was proposed. Baked chicken with rock salt in ancient method (古法鹽焗雞) - this was one delicious chicken. The meat was moist - even the breast - but chewy. Chewy because this wasn't just some battery farm chicken that's been chilled or, worse, frozen. I didn't ask the staff, but I'll bet this was probably Long Kong chicken (龍崗雞). It had flavor, and I don't mean salt. Speaking of salt, this was probably the least salty salt-baked chicken I remember having. That, I like. Pea shoots in superior soup (上湯豆苗) - it's amazing how something simple could surprise you when you least expect it. Nothing more than a dish of blanched young pea shoots, or is it? The magic was in the superior broth, which was much more complex in terms of flavor than usual... and noticeably thicker and rounder in texture. So elegant and beautiful. Stir-fried glutinous rice with assorted preserved meat (生炒糯米飯) - another dish we all looked forward to very much. A little soft and wet, and certainly not as much wok hei as we had hoped for. Tasty nonetheless, but here the private kitchen won another round. Sweetened almond cream with egg white (蛋白杏仁茶) - decent but nothing spectacular. The chocolate fairy had recently returned from ChocolateLand, and brought with her a box of Sprüngli Cru Sauvage that I love so much. I wasn't greedy and only took one truffle, but I was happy just to have had a bite of this precious cargo at all. 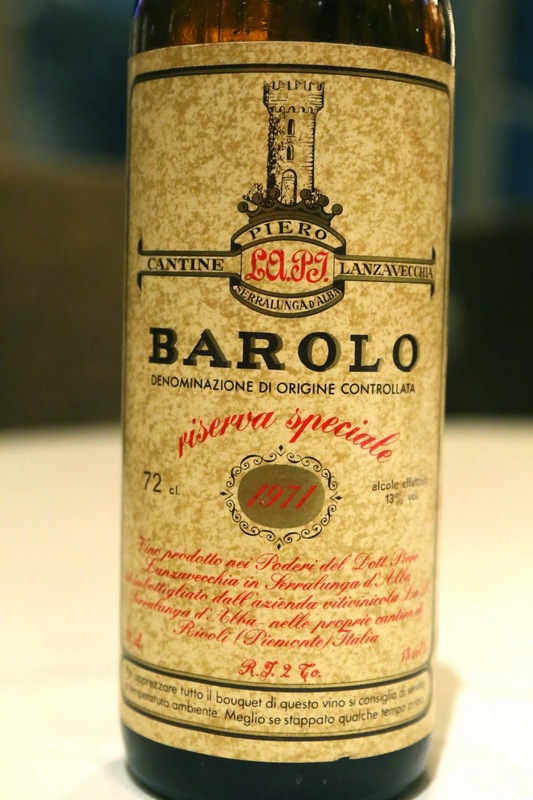 1971 Cantine Lanzavecchia Barolo Riserva Speciale - clearly over the hill, like a few other Barolos from similar vintages I had lately. Definitely very sour plum drink (酸梅湯), fragrant, like drinking Huadiao after a salty plum (話梅) has been dunked it in for a while. Savory and a little smoky on the nose. 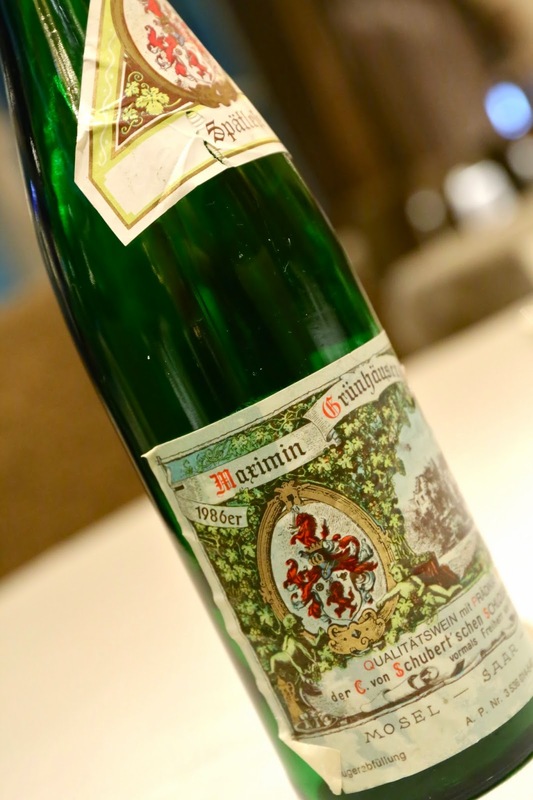 1986 von Schubert Maximin Grünhauser Herrenberg Riesling Spätlese - lovely nose, a little pungent, with a little marmalade. Palate was drier than I expected, with crisp acidity here, but as it opened up it became smoother and rounder. The plastic and polyurethane notes were a little more obvious later. 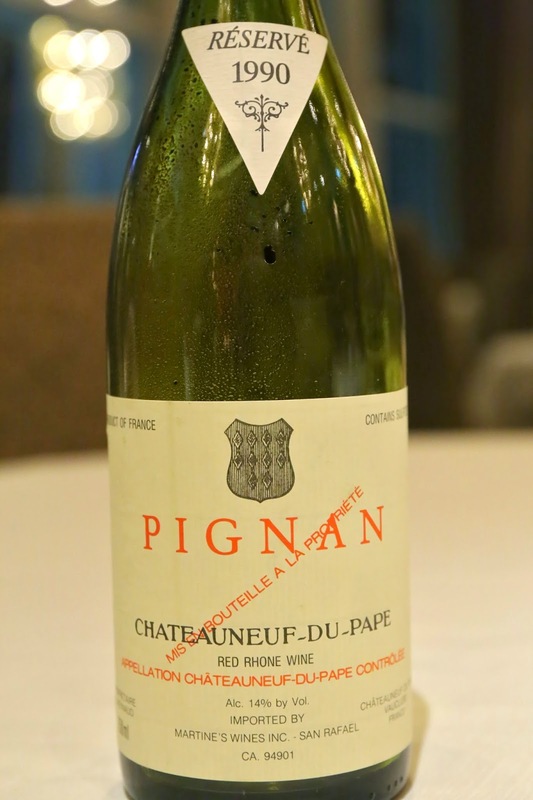 1990 Pignan - nice and sweet fruit here, surprisingly fragrant nose, with a little animal. Drinking beautifully now. 2006 Guiraud - really fragrant, floral like a perfume. Really sweet like honeydew, with notes of marmalade. Very young and fresh, and less acetone. Surprisingly nice. I think we ate very well tonight. There were certainly no fails, and we were treated to a few magical moments. The surprise for everyone, though, was that the food tonight underperformed that of the private kitchen. I can't be sure that Chef Lee cooked our food or was even in the kitchen tonight, since it's not customary for chefs at Chinese restaurants to come out and greet guests... and we were certainly no VIPs. But our expectations were certainly a little higher. Speaking of which... now I'm really looking forward to dinner on Friday, as I head back to the private kitchen to have a number of the same dishes. A real head-to-head! The shrimp is a work of art. Stunningly beautiful!